Our Manassas, VA Insurance agency team has been busy this year working as part of the community- both volunteering and sponsoring local events. Agency owner, Christine Angles, recently joined the board of Friends of SERVE, which supports the local SERVE shelter on Dean Dr., in Manassas VA. 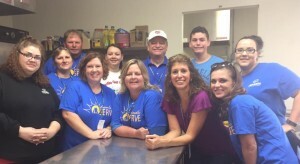 The Friends of SERVE prepare monthly breakfasts at the shelter, volunteer at SERVE events (like the golf outing and bowl-a-thon), and hold quarterly happy hours to bring attention to SERVE and gather donations. Christine and her team also have worked with the Manassas Park /Cougar Elementary Schools, Ellie’s Hats, and Vienna Youth Football League. Volunteering in the Manassas, VA community is an extension of what we do every day – helping families with the important aspects of their lives.